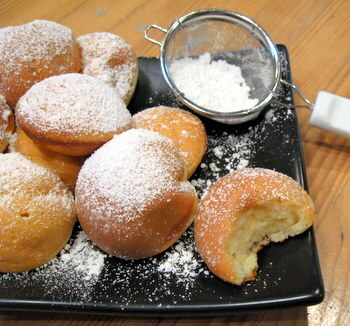 Aebleskiver, or ebelskiver, are small spherical pancakes. They’re traditionally Danish, but the pancakes have been enjoying an upswing in popularity lately and are a little more common now than they once were. The pancakes are often filled with fruit or jam, rather than being served with syrup. You might not see the real name associated with recipes for these little treats, though, as some stores have decided to rename them simply “filled pancakes” to make them seem a little more approachable to consumers. The batter for aebleskiver is a fairly typical pancake batter. The primary difference between a regular, American pancake and one of these is that the aebleskiver need to puff up high enough to fill out their pan and make a spherical shape. To help the pancakes along, egg whites are separated and beaten to soft peaks, before being folded into the batter. 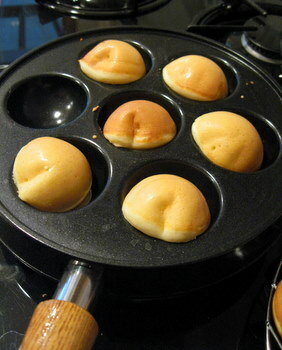 You need a special pan to make aebleskiver, one with round depressions to hold the batter. Older pans will be cast iron, but many are now available with nonstick surfaces. The pancakes are cooked on one side, then flipped over using a skewer to cook on the other side and fill out their signature shape. When I’ve made aebleskiver in the past, I’ve stuck with the traditional filled-pancake idea. This time, I wanted to get more of an “American pancake” flavor into the aebleskiver – meaning that I wanted something I could dip into maple syrup. I used buttermilk in the batter and they turned out beautifully. The pancakes were light, tender and very fluffy. 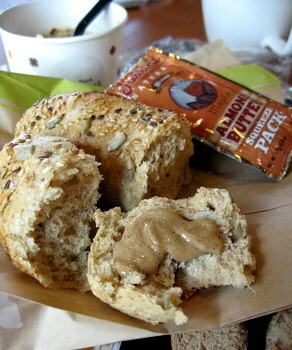 The interiors are moist, but fully cooked, and have a great consistency for soaking up a bit of syrup. They’re good on their own, with just a dusting of powdered sugar, too. In a large bowl, whisk egg yolks and 1 tbsp sugar until sugar is dissolved. Add vegetable oil and buttermilk and mix well. Whisk in salt, baking powder and flour until batter is relatively smooth, with only a few lumps, and no streaks of flour remain. In a medium bowl, beat egg whites with remaining tbsp of sugar until soft peaks form. Fold into flour mixture. Once the batter is made, heat aebleskiver pan over medium heat until very hot. Brush each of the wells with a bit of vegetable oil, then fill each indentation just about to the top with batter. When the batter bubbles slightly (just like a regular pancake) and the bottom is golden, turn over by inserting a fork (or skewer) into the side and flipping quickly. Cook until second side is golden brown. If the aebleskiver are too dark, turn he heat down slightly. Keep in a single layer in a slightly warm oven until serving, if not serving immediately as they cook. Serve with powdered/confectioners sugar or syrup, for dipping. Those look dangerous…I’m sure it’s easy to “just have one more”…which in my case would probably be 10 more! Yum! Thank you so much for posting these. I recently purchased one of these pans and have been waiting to try it out. You have given me the confidence to give it a go. I’ve found here through Bake or Break and now I just had to comment because you were doing these marvellous Danish Christmas treats! I spent a year in Copenhagen and just fell in love with these! I also have a pan to make them and plan to make having them a Christmas tradition for my family. Take a look at my baking blog as well, if you’re interested. I write my texts in both Finnish and English. Ã†bleskiver are a family favorite for us. In Denmark, you know it’s Christmas season when Ã¦bleskiver are served as after school treats, in the cafÃ©s and for tea. Now that we are in the U.S. we are getting better at making our own – I prefer the cast iron pans. I had never considered cooking a pancake-style batter in this manner, but I am excited to try it out. The pan looks an awful lot like a takoyaki pan too. I love these, especially with jam in the middle! Thanks! I’m going to try this out with my takoyaki pan! I just had these yesterday for the first time! I’m so pleased to find your wonderful version so I can make them. Lovely. Just wanted to advise a nice little cast iron aebleskiver pan at TractorSuppply.com for $9.00; I bought one for my husband for Christmas. We bought this off tv but it was sold as “pancake puffs! !” the kids just love them! thanks for the recipie!